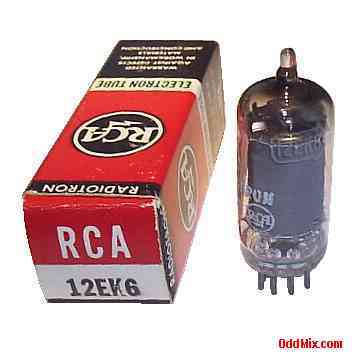 This is a genuine, vintage discontinued type RCA 12EK6 Remote-Cutoff Pentode electron tube. Miniature type used as RF or IF class A amplifier in many lightweight, compact, portable operated equipment. This tube is capable to operate with extremely low B+ (anode) voltage. These miniature, lightweight, portable, compact, tubes were developed to work with the automobile 12 Volt battery as anode supply. Useful part for antique radio, car radio or television restoration. It is a NOS tube - New Old Stock, unused, boxed, excellent condition. Difficult to find device!